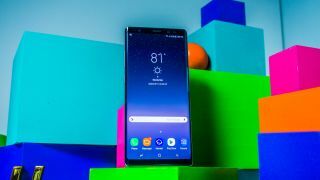 Samsung Galaxy Note 8 pre-orders have topped any previous Note smartphone, Samsung announced today, a major coup considering the year the company has had, plus the fact a significant contender is right around the corner: the iPhone 8. While Samsung didn't reveal exact presale numbers, it said more people in the US bought the Note 8 than any previous model during the same time period. Pre-orders for the Galaxy Note 8 went live in the US on August 24, and the phone is set to hit store shelves in the US and UK on September 15. Anyone who orders a Note 8 between August 24 and September 24 will also be treated to a free Samsung Gear 360 camera or a free "Galaxy Foundation" kit, which includes a Samsung 128GB EVO+ microSD and Fast Charge Wireless Charging Convertible. At $929 (£869, AU$1,499), the Galaxy Note 8 isn't cheap, but it packs a hefty 6.3-inch display, 6GB of RAM and a double rear camera, giving you a lot for your money. We called it the "best big phone you can buy" in our review. Considering the Galaxy Note 7 disaster last year, in which the previous-gen phablet was recalled twice, successful Note 8 presales suggest customers aren't deterred. What's more, Apple's iPhone 8 is due to launch on September 12, just a few days before the Note 8 arrives in stores. Some customers, it seems, aren't waiting to see what Apple has cooking, and are securing their Note 8 well ahead of time. TechRadar will be live at Apple's big event on Tuesday and will let you know just how the iPhone 8 stacks up to the Note 8. Based on today's news, Samsung probably isn't too worried. Or maybe you're waiting for the Google Pixel 2?